Therios 300mg Palatable Tablets for Dogs are round scores beige palatable tablets. Each tablet contains Cefalexin 300mg. Therios tablets can be divided into equal halves and quarters. 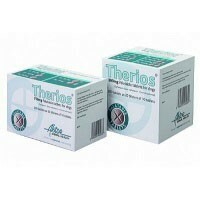 Therios Palatable Tablets can be used for the treatment of bacterial skin infections caused by organisms sensitive to cefalexin. It can also be used for the treatment of urinary tract infections caused by organisms sensitive to cefalexin. Tablets may be crushed or added to a small quantity of food immediately prior to feeding if necessary.